Sabrina Alexis' new book is a stunning and truthful dissection of what it really takes to create a real, loving relationship. Read these when you are seeking advice at any stage in a relationship. You can’t force someone to change and to want what you want. You can’t convince someone to feel a certain way about you. Infatuation causes you to fall in love with an image rather than an actual person. It causes you to put someone on a pedestal and overlook his flaws. Since he’s so ‘perfect,’ you become afraid to be yourself— I mean, how could your true self ever compete with perfection? You need to know your values, your boundaries, your fundamental needs, your wants, what you can compromise on, and what your absolute deal-breakers are. As soon as you’re in that place where you are your best self and you mirror the qualities you want, you’ll notice an instant change in your love life; you’ll find that you can easily get the kind of guy and the kind of relationship you’ve always wanted. I realized that with Kevin I felt less alone and maybe a little understood. Like me, he was a little lost and hurt, and that made me feel better in my own world of lost and hurt. Why was I so wrapped up in getting inside his head? The reason, I believe, is that getting lost in his drama was an escape from dealing with my own. Instead of feeling sorry for myself because I couldn’t get him to commit in the way I wanted, I felt sorry for him for having so many issues, issues that prevented him from committing to a great woman he had right in front of him. What happened to me is something that happens to many women after a toxic relationship and crushing breakup: I internalized faulty beliefs about myself and never challenged them. We’re told that love conquers all, but in truth love alone does not make for a good and healthy relationship. 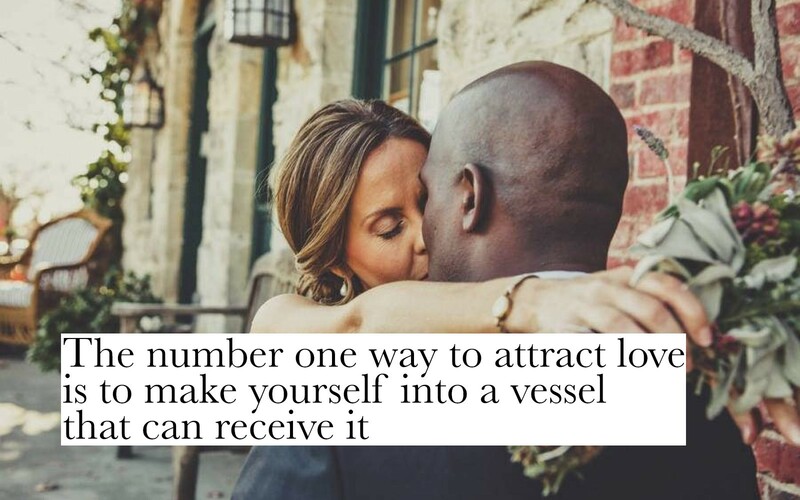 The number one way to attract love is to make yourself into a vessel that can receive it. Your reality is created in large part by your filter system. If you believe that the guys you want will never want you, you will find a justification for this fear even if it’s far from the case. My last relationship had instilled a belief in me that I was unworthy of love, that I would never get the guy I wanted, that no man would love the real me … so I sought out guys who weren’t in a place to love anyone, really, and was proven right time and time again. A relationship is going to unfold in only one of two ways: it will either last forever or it will fall apart. In order to get the relationship that lasts, you have to come to terms with all the ones that didn’t. When you go through a breakup, you may be missing the feeling of being loved and cared for. To fill this empty space, surround yourself with people who genuinely care about you and love you for who you are. You convince yourself that no other man on the planet has the same qualities as him and thus you have two choices: get him back or settle for someone who will never measure up. I hope you can recognize the absurdity of this! When a guy opens up to you, when he shares his dreams, his fears, his hopes, his wishes, his motivations, etc., he is investing in you. By investing in you, he is committing himself to you. If you run into each other here and there and talk for hours and maybe even hook up, but you don’t hear from him after… he likes you, he just doesn’t like you enough. When it comes to love, the rule to live by is never allow yourself to care for someone who hasn’t shown he cares about making you happy. In a romantic relationship, love will give you stability, partnership, and acceptance, but lust will give you passion, fire, and sexual satisfaction. You can be totally perfect for one another, you can love each other like crazy, you can be wildly attracted to one another, you can even be soul mates, and you will still have to work at it. ...what we call ‘love at first sight’ is really intense lust and desire coupled with the recognition that there is the potential to create something meaningful with this other person. There are many ways to keep the lust alive in your relationship, you’ll probably discover them all by just thinking about how things were in the beginning of your relationship, back when you were overcome by a magnetic force of physical attraction. Men cannot resist a woman with a smile. Happiness isn’t something you get from a relationship (although a relationship can certainly add to your level of happiness), it’s something that spills into your relationship. Instead of focusing on what your partner should be doing, try to look at what he is doing right in the relationship and show appreciation for those things. The more your man feels appreciated, the more he’ll want to do to make you happy. Here’s the thing that no one really tells you: good relationships don’t always feel all that good… but it’s not for the same reason bad relationships feel bad. Sometimes you’ll feel unloved, insecure, angry. Sometimes you’ll want to just run, and sometimes you’ll feel really lonely, and that will surprise you, because how can you be lonely in the company of someone who truly loves you? Men are not responsive to nagging or criticism, but they can be enormously receptive— and appreciative— when you tell them what makes you happy in a loving way. Bad relationships are the ones filled with drama. The highs are higher and the lows are lower. When I say ‘bad relationship,’ I mean everything from a toxic, codependent situation to a relationship with a man who won’t commit in a significant way, to a match that is simply incompatible. Choice is everything. It will largely determine if a relationship succeeds and lasts or fails and leaves you broken-hearted. The good news is that you have the power to choose the man you let into your life. Stop freaking out! Relationships aren’t that hard, they only feel hard because we stress over them for no reason and create problems when there aren’t any. Everything will be OK, just relax and trust the timing of your life. The chase creates the illusion of confidence and leaves enough uncertainty to create the illusion of chemistry. Everything feels more dramatic and exciting when we don’t know how the other person feels. But a relationship isn’t built on uncertainty. Like attracts like. That is, what you are or think you are is what you will attract. When love is real and genuine, it will flow easily and effortlessly.